The two-station Cadex C7200 suits smaller organizations and storefront operations. 40 watts of charge power at 4 amps per station ensure quick service of larger batteries. This economical analyzer offers similar features to the larger C7400. The Cadex C7x00 Series battery analyzers are more than programmable power supplies to charge and discharge batteries; they assess the condition of a battery and provide intelligence to safely service them. Protected algorithms with redundant safety features identify a faulty battery and terminate the service with message when so needed. The green light on the charger does not reflect battery performance. 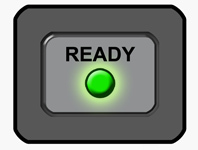 â€œReadyâ€ simply indicates that the battery is fully charged. 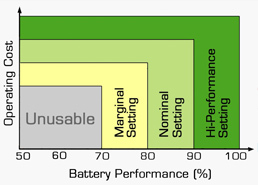 A battery should be replaced when the capacity s to 70â€“80%. Most users are unaware of capacity fade until an unforeseen power loss occurs. Nor should a battery be replaced too soon. The Cadex C7x00 Series battery analyzer enables to keep batteries for their optimal life span. The C7x00 analyzer test batteries by a discharge/charge cycles or a rapid-test function. 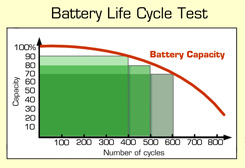 A full cycle is the most reliable method but it is not practical for large batteries. Rapid-testing is not available for all batteries. QuickSortâ„¢ classifies single Li-ion cell of up to 1500mAh into Good, Low and Poor. Capacity is the leading health indicator; and Cadexâ€™s proprietary electrochemical dynamic response method achieves a sort accuracy of 90-95%. 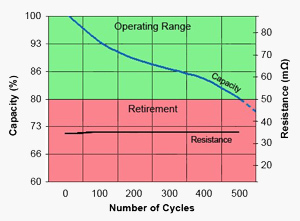 Reading internal resistance to estimate battery health is no longer reliable; modern Li-ion keeps low resistance. The target setting allows customizing performance needs to ensure adequate capacity levels for all fleet batteries. 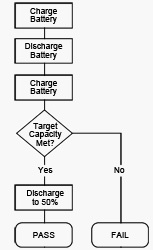 If below target, the Auto program reconditions a nickel-based battery with a deep discharge. Recondition reverses the â€œmemoryâ€ effect. â€¢ 90%: Maintains batteries for critical use. Fewer batteries will pass. â€¢ 80%: Recommended (default) setting. â€¢ 70%: For less stringent applications. More batteries will pass. The C7x00 captures the battery parameters in a unique C-code that is stored in the battery adapter. Each adapter holds 10 C-codes that you can edit. You can also compose your own: The Basic C-code contains the rudimentary information; the Extended C-code revert to default setting unless changed manually. The Custom programs turns the C7x000 into a laboratory instrument by allowing user-defined settings of charge, discharge, recondition, wait and repeat. You can set conditional gates that proceed on a different course if certain criteria are not met. This program assists in the selection of battery models and performs incoming inspection. The C7x00 analyzer also offers dynamic stress tests to examine batteries under different load levels. The programs are automated; PC-BatteryShopâ„¢ plots and stores the test results. Password protection prevents unauthorized changes of settings. Level 1 allows minor changes and Level 2 inhibits most programming. No system is complete without well-designed software. PC-BatteryShopâ„¢ enhances the Cadex C7x000 Series battery analyzers by being able to observe voltage, current and temperature in real-time graphics. Advance the Cadex analyzer into a true workhorse. PC-BatteryShopâ„¢ provides a simple, yet powerful PC-interface to control and monitor Cadex C7x00 Series battery analyzers. The dabase holds over 3,000 batteries and a mouse click or bar code swipe configures analyzer. The battery library can be edited or downloaded from our Product Support section. 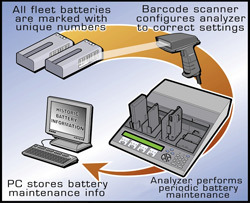 PC-BatteryShopâ„¢ operates 32 Cadex C7x00 Series analyzers for service of 128 batteries. Voltage, current and temperature information is shown in real time graphics. 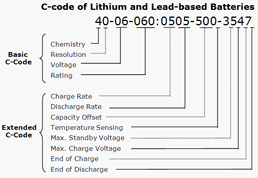 PC-BatteryShopâ„¢ simplifies fleet service by attaching a permanent ID number to each battery. The label printer generates the labels in bar code. To service a battery, simply scan the label and insert the battery. PC-BatteryShopâ„¢ configures the analyzer and displays the battery history that includes age and past service reports. Warranty batteries, and those that had been returned, no longer need to be discarded. 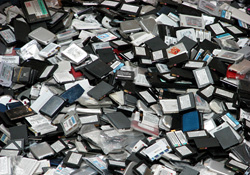 Studies show that 90% of returned mobile phone batteries can be restored with Cadex battery analyzers. The QuickSortâ„¢ program provides a clear assessment of the battery condition in 30 seconds. With PC-BatteryShopâ„¢, the PC becomes the command center from which to enter parameters and program sequences. 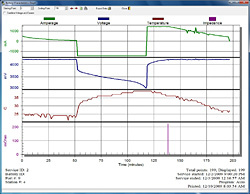 You can customize charge terminations, fine-tune the end-of-discharge thresholds, and observe voltage, current and temperature in real-time graphics on the PC monitor. Cadex analyzers will test batteries at a fraction of cost to competitive systems. If current is set above 4A (6A), unit automatically scales down to stay within range. Services up to 24Ah batteries. Batteries on a fully loaded system may go on waiting queue. Will resume when demand moderates.